A Super PAC aimed at knocking unpopular incumbents out of office — and funded largely by Texas donors — won its first race this week, upsetting a Republican primary in Ohio. Updated, March 8, 2:47 p.m.: The Campaign for Primary Accountability got its first big win this week, when Ohio incumbent Rep. Jean Schmidt lost the Republican primary to opponent Brad Wenstrum. It was a surprise defeat for Schmidt, who has been in office for seven years. Wenstrum, a podiatrist and Iraq War veteran, has never held political office. In an article this morning, The New York Times credited the Super PAC with "increasing Congress' sense of insecurity." Houston construction mogul Leo Linbeck III, the self-described "conservative communitarian" who has led a national effort to shift control of the nation's health from the federal government to the states, is now trying to shake up the country's political primaries. He has poured more than $775,000 into a new Super PAC — the now $1.8 million Campaign for Primary Accountability — designed to fund primary challengers to longtime incumbents on both sides of the political spectrum. From an issues standpoint, Linbeck can't be described as middle of the road. He's been a staunch advocate for smaller government, from backing local control of health care to charter schools to abolishing the federal income tax. His father co-founded the powerful tort reform group Texans for Lawsuit Reform. But the idea behind the Super PAC, he said, is strictly nonpartisan: It's to level the playing field in primary elections so that incumbents don't automatically have a financial leg up, or a so-called message monopoly. Linbeck said the Super PAC won't target freshmen or two-term lawmakers, or those who perform strongly in the polls. They're not going to operate in swing districts, which already have accountability based on their fluid politics. And they'll only back candidates they think are credible. The money for the effort is largely Texas-based. Of the 16 other contributors to the group, 13 are Texans, including Midland oil and gas investor Tim Dunn, who contributed $350,000. Other than Linbeck, the biggest single donor is Joe Ricketts, the Denver-based founder of an online brokerage firm, who gave $500,000. Wisconsin Libertarian advocate Eric O'Keefe, who pushed the Health Care Compact with Linbeck and helped organize the Super PAC, contributed $100,000. Linbeck and his supporters say that voters are disgusted by the federal deficit and blame Congress, but that incumbents are getting re-elected anyway. The problem, they say, is that most congressional districts are controlled by a single political party — and that there's little incentive for primary challengers to try to unseat an incumbent backed by special interests and lobby funding. "Primaries are basically the way the deck gets stacked. Incumbents have all the advantages — money, name ID. The general elections are not competitive," Linbeck said. "The only place you can really have your voice heard is in the primary. We want people to know that, and we want them to turn out." 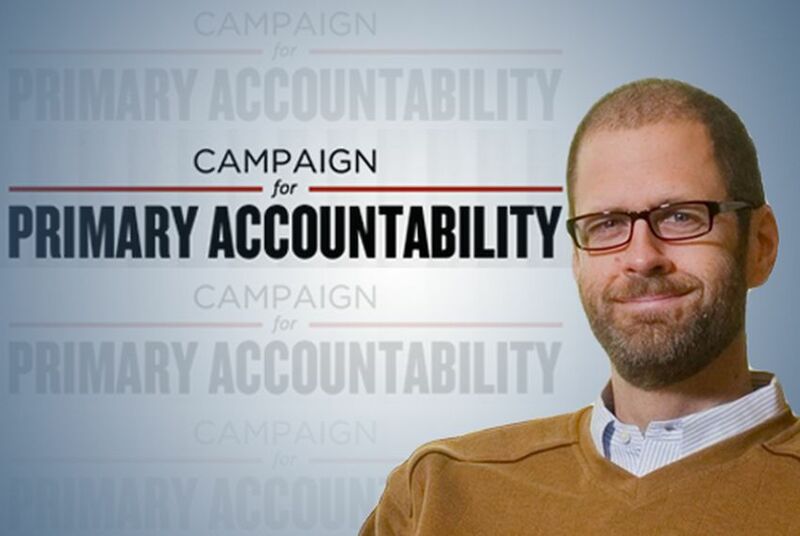 Contributions to Campaign for Primary Accountability, Inc. The Super PAC's effort to unseat Reyes has drawn some scrutiny; the organization received nearly $20,000 from Campr II Partners, which is owned by the El Paso father-in-law of Robert "Beto" O'Rourke, who is running in the Democratic primary. Reyes slammed the new Super PAC, saying it's an example of "special interest money and family wealth" being used to "undermine the vote and will of the people." Reyes said those who are funding the Campaign for Primary Accountability include wealthy El Pasoans and corporations that have maxed out their campaign-giving to his opponent, O'Rourke, and are using loopholes to pump even more cash into his race. Linbeck said that contributions don't drive the group's decisions on which races to get involved in, and that he expected it was obvious to the Super PAC's funders which incumbents were at risk. The biggest name the Super PAC is backing so far? Rep. Dennis Kucinich, who is running in a Democratic primary in Ohio against longtime incumbent Rep. Marcy Kaptur, who has been in office for 15 terms, and whose district was redrawn. The group is also playing in Republican races in Illinois and Alabama, among others. "We've got people on both sides of the political spectrum mad at us," Linbeck said. Leo Linbeck III is a major donor to The Texas Tribune.